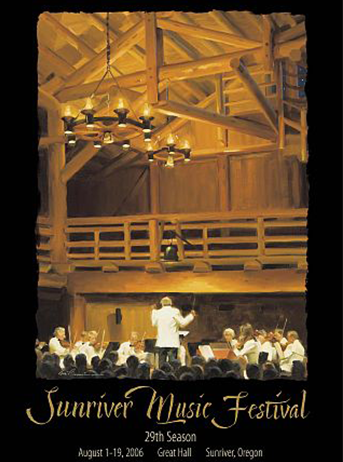 Central Oregon's Classical Music Experience! Stop by the Music Festival office in the Sunriver Village Mall (Building 13) to check out our assortment of merchandise and gifts. We have specially-selected wines from favorite Oregon wineries, wine glasses, coffee mugs, CDs of our concerts and soloists, notecards, and posters. 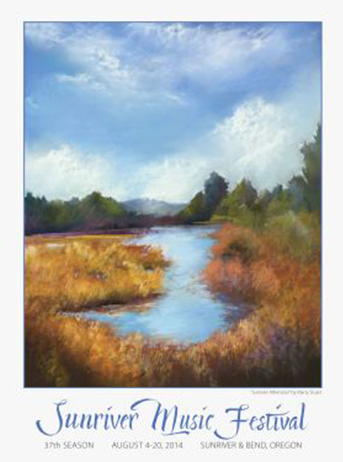 Each year, local artists are invited to submit a piece of artwork for the annual festival poster. We have framed and unframed prints of several years’ posters available at the office for purchase – Stop by and peruse the gallery on our walls going all the way back to the debut 1978 season to see which fit best in your decor! Following is about the artwork selected for 2018 - our 41st Season in which we joined with orchestras around the world in celebrating the preeminent composer and conductor Leonard Bernstein. 2019 poster art to be announced very soon! 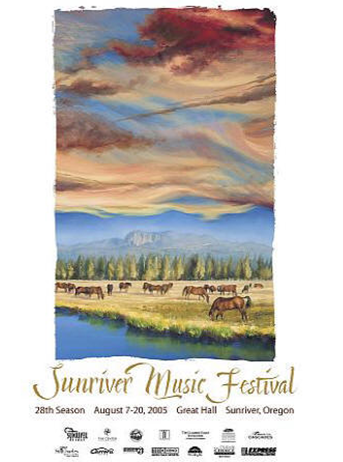 Kenneth Marunowski - "Wonderful Town: Sunriver Suite"
Kenneth Marunowski's original painting “Wonderful Town: Sunriver Suite” has been selected as the Sunriver Music Festival’s poster artwork for 2018. 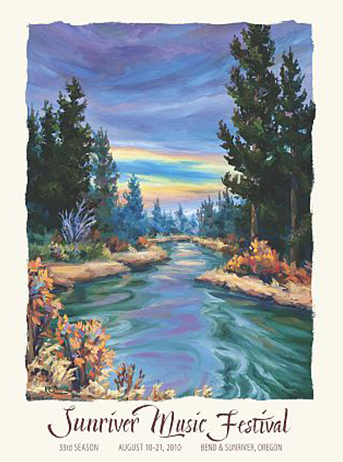 Each year, the Festival selects a Central Oregon artist to create the artwork for the annual festival poster. Local artists were invited to submit a piece for consideration and a committee of art enthusiasts selected Ken's artwork. 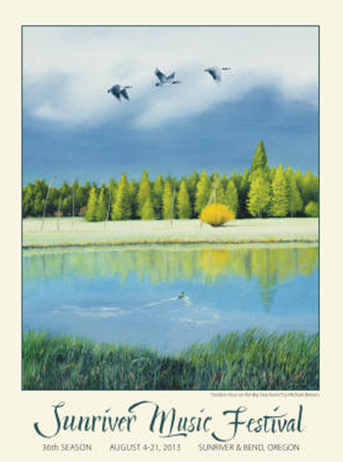 Ken Marunowski's original artwork was framed by Eastlake Framing and is currently on display at the Sunriver Music Festival office. 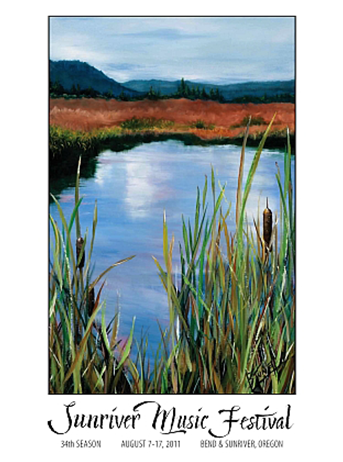 The artwork will be a featured auction item at the Festival’s annual fundraiser, Festival Faire, on Sunday, July 15 at the Sunriver Resort Great Hall. Festival Faire includes an evening of elegant dining and a lively auction with music provided by a select group of talented 2018 Young Artists Scholarship winners. 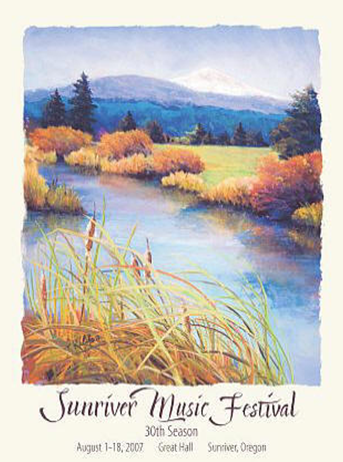 Over 300 posters featuring Marunowski's "Wonderful Town: Sunriver Suite" artwork will be distributed for display in businesses in Sunriver, Bend, Sisters, and Redmond. 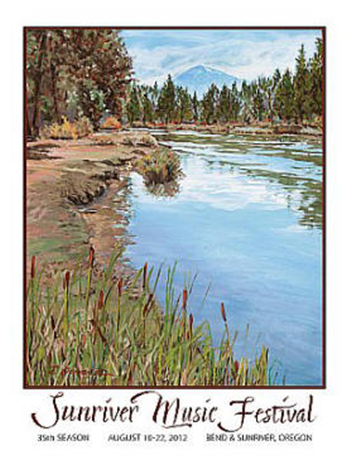 Posters are also available to purchase at the Sunriver Music Festival office in The Village at Sunriver and at various businesses and galleries in Sunriver and Bend. 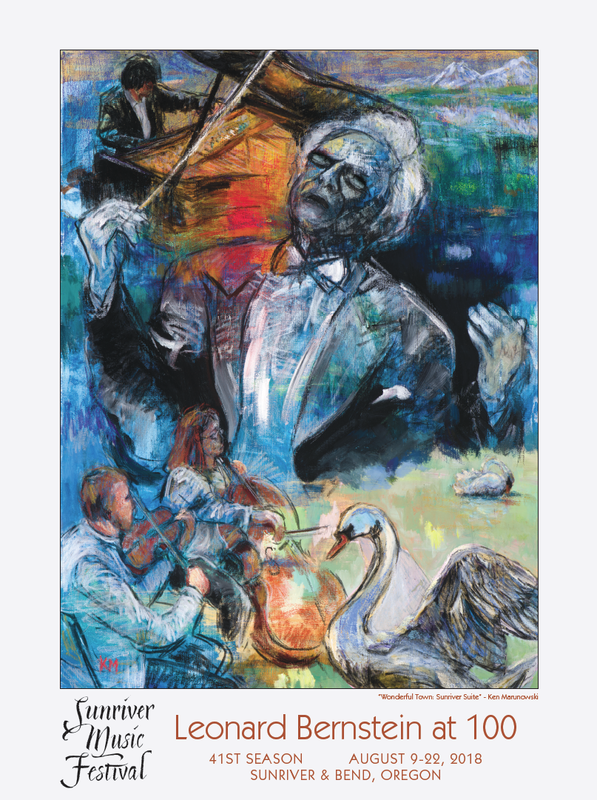 "Wonderful Town: Sunriver Suite" is a mixed media (acrylic, charcoal, crayon, oil stick, pastel) on canvas, 40"x30" created specifically for the Sunriver Music Festival's 2018 season celebrating the preeminent composer and conductor Leonard Bernstein. 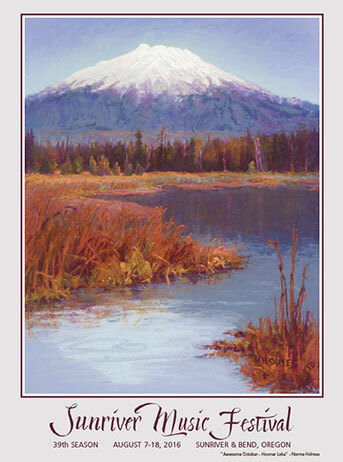 "Like so many artists past and present, nature serves as my primary source of inspiration. I revel in the many “scapes” available to explore, whether land, sea or sky, and sometimes even sound. I represent this inspiration through oil paintings and drawings in pencil, charcoal or pastel, usually of a modest size, though lately in increasingly larger formats. I typically explore a given subject, or motif, more than once, using repetition as a means to more fully understand it and my feelings for it, which allows for a more complete form of expression. 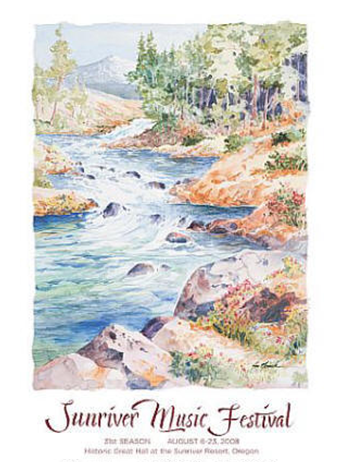 These feelings and sensations I derive from nature are, in part, what compel me to paint, for example, the magnitude of mountains, vast and overwhelming, or the mesmerizing calm evoked by the soft trickle of a lonesome creek. Nature is, in other words, my point of departure. Ideally, while painting before the motif, “en plein air,” as the French call it, I follow these feelings, allowing them, along with the motif, to guide me, my color choices, my mark-making such that I depart from literal depiction and approach the poetic, the expressive. When I am able to inhabit this blissful space, proceeding almost unknowingly, caught up deeply within the moment of creation, and hovering somewhere between representation and abstraction, my painting is at its best. 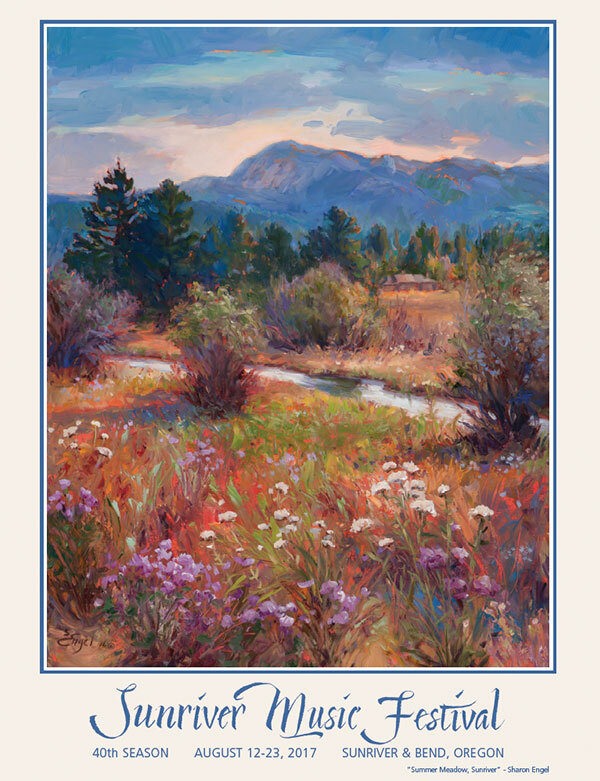 It is this aspect of making the painting, that is, exploring the relationship among nature, my materials, and my “art spirit,” that pushes me further and further along the artistic path, an open-ended journey of self-discovery to be shared with all who dare." Ken Marunowski is an artist (B.F.A. Painting, 1995) and educator (Ph.D. Literacy & Rhetoric Studies, 2006). Between 2006 and 2015, Ken taught professional writing for arts and letters students at the University of Minnesota Duluth before devoting himself fully to his artistic practice. 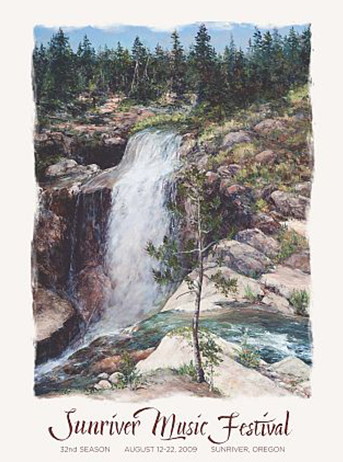 Primarily an oil painter, Ken executes much of his art “en plein air” (in open air), the results of which he often uses in the studio as inspiration for additional works. Ken also enjoys depicting live music, using the energy and movement of the music and musicians as the source for rapid, gestural depictions of sight and sound. Awarded a 2016 Summer Artist Fellowship at the Marchutz School of Fine Art in Aix-en-Provence, France, Ken participated in the artistic life of the school and delivered a lecture on the intersection of painting and writing in the life of the artist to the university community. 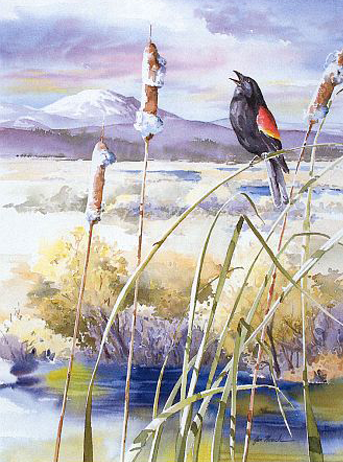 Ken currently resides in Bend, Oregon. 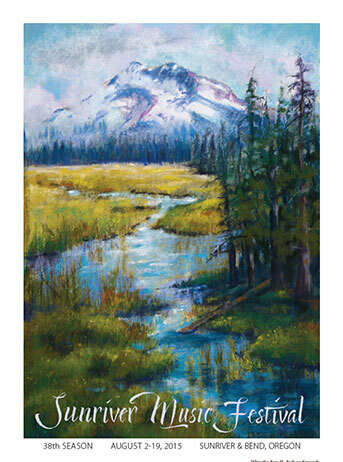 Sunriver Music Festival posters are available for $12 ($18 shipped). Framed posters are $65. Notecards are $12 for a pack of ten. 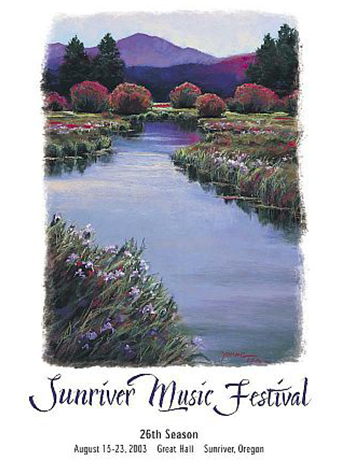 All merchandise available at the Sunriver Music Festival office.